The McFlurry van was going to be stationed at a few UK festivals summer 2017. To create buzz around this, we were commissioned to create a container in which to distribute a festival survival pack. 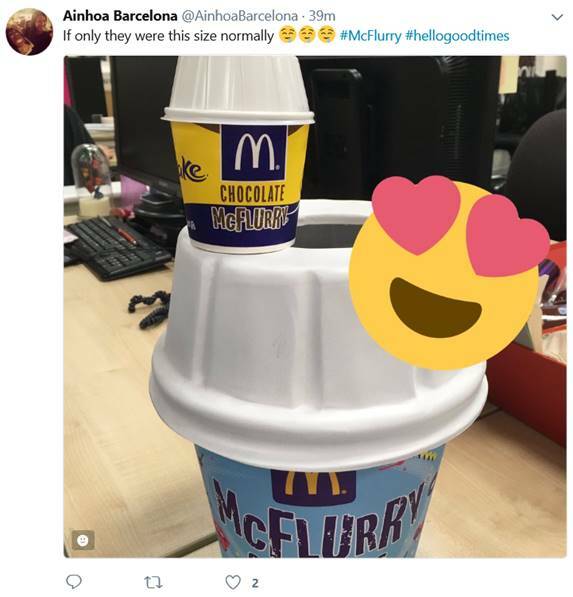 Artwork was provided from McDonalds of their summer McFlurry design. The challenge to this job was to create an oversized container within a very tight budget. The lids were made bespoke just working off the normal size replicas. In order to find a large enough container, hundreds of the largest size of popcorn tubs were wrapped in the summer McFlurry artwork - which was resized and printed to fit the mold of the popcorn. All of this done without being provided a die line. All the lids and wraps were hand fashioned to create the final look and feel of this piece. One of the most exciting results of this project was the sheer volume of social media interaction it received. The media ate it up!